Lee, Aug. 24, 2018, on Sixth Street in Austin, Texas. 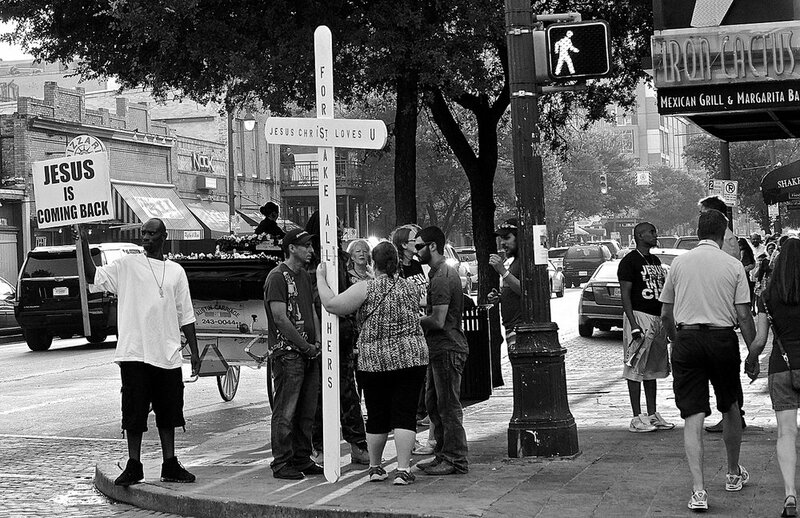 Marcus Wilson, a 19-year-old student at Austin Community College, on Sixth Street in Austin, Texas. Tina, on Congress Avenue in downtown Austin, Texas. Aug. 22, 2018, portrait of David Watkins on South Congress Avenue. 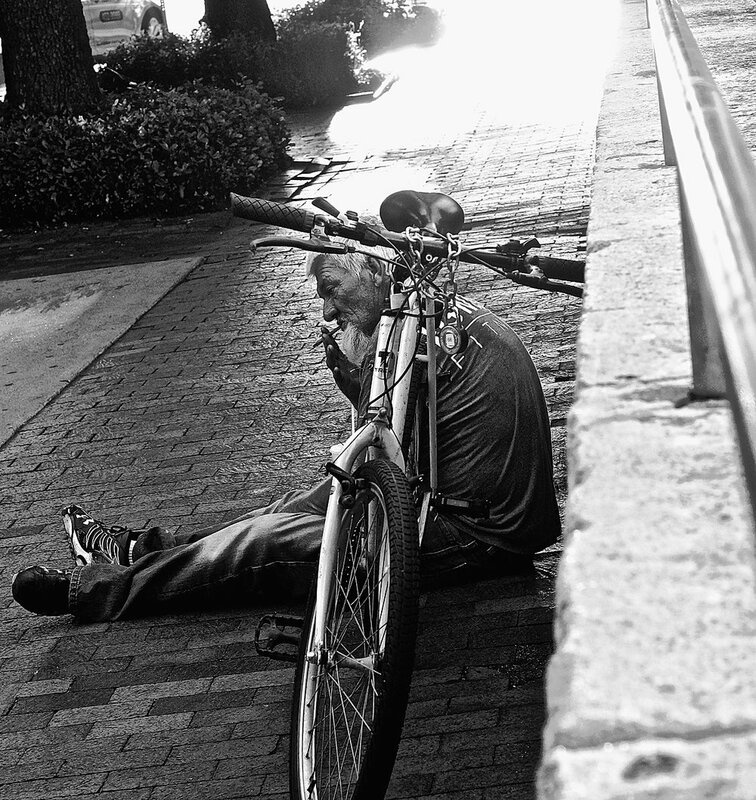 David is living on the streets of Austin, Texas. Daniel Berringer, near downtown Austin, Texas. I met Daniel on a Thursday evening on Seventh Street, just east of Interstate 35. We talked for a while, and Daniel filled in a few details of his life: As a younger man, he worked for a time as an assistant manager at a computer supply warehouse. 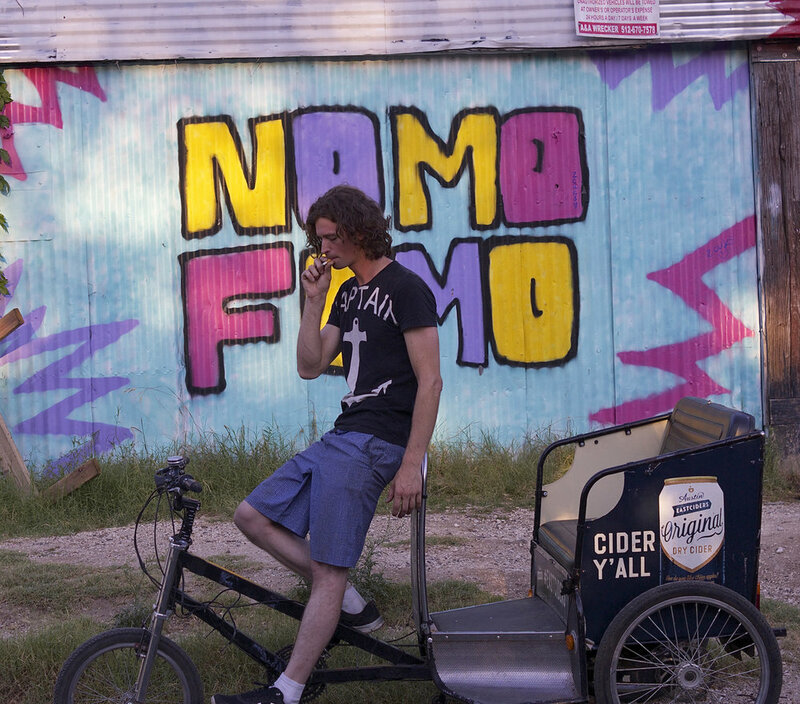 Now homeless and subsistent on disability checks, he’s living on Austin’s streets. He’ll turn 61 on July 12 — or, as he prefers to see it, 16, with the numbers transposed. 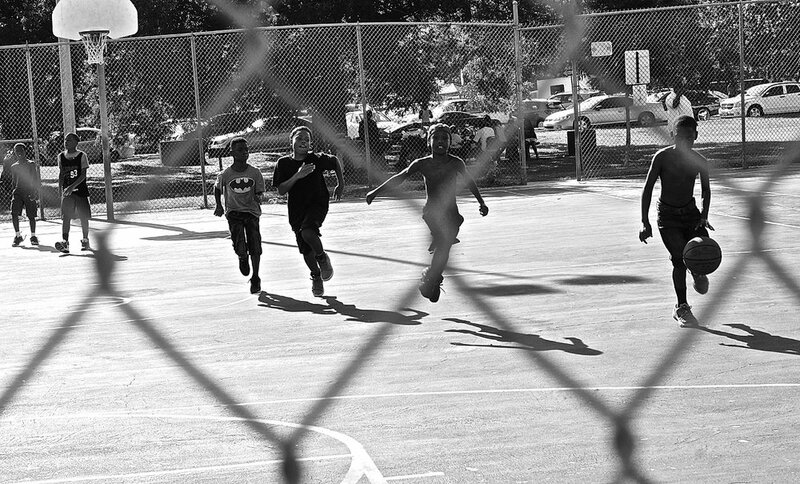 Fifth Street, East Austin, Texas. Johnny Rivera, a longtime fixture on Sixth Street in Austin, Texas, sits outside Esther's Follies where he regularly helps shepherd traffic past the comedy club's signature sidewalk window. The works of gifted artist Mjumbe (Benny Sorrells) may be seen via Art from the Streets (www.artfromthestreets.org), a free and open studio in Austin, Texas, that serves the homeless community. Nowhere is the relationship between man (and woman) and machine more poignant than during the annual Republic of Texas Biker Rally, which brings thousands of motorcyclists to Austin. Running Wolf with his dog, Spade. SÍGNY performs a sublime version of Prince’s “When Doves Cry” during the Pecan Street Festival in downtown Austin. 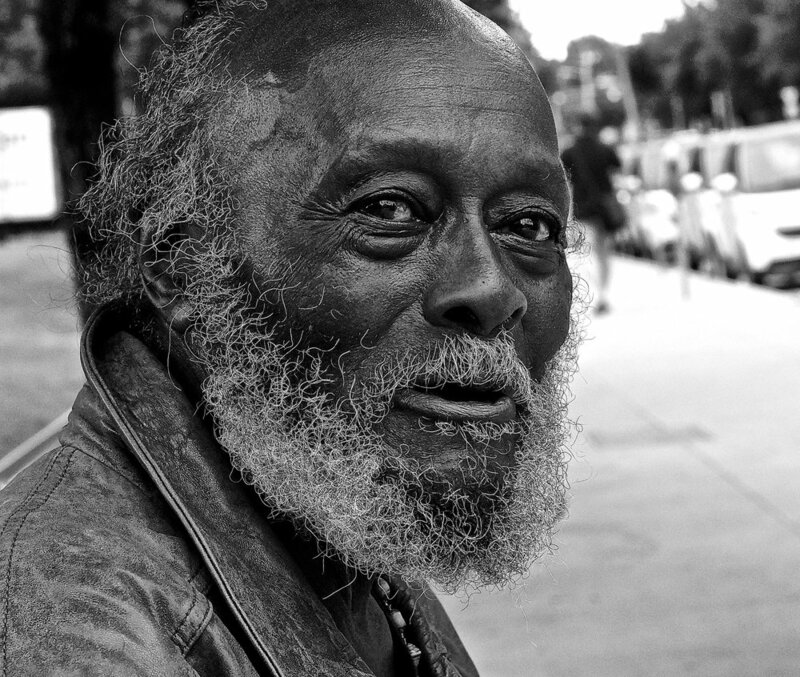 SoCo Joe, who is homeless, is a permanent, beloved fixture in the South Congress Avenue District in Austin, Texas. Two years ago, Joe was hit by a car and suffered extensive injuries, including a broken hip for which he underwent surgery. He ambles along with the help of a wheelchair that serves the dual purpose of carrying his possessions and providing balance as he walks. Street musician Jerry Wagers, a singer and guitar player, performs on New Year's Eve on South Congress Avenue in Austin, Texas. Zane, a street musician who plays guitar, performed on New Year's Eve on South Congress Avenue in Austin, Texas. Zane, a street musician, performs on New Year's Eve on South Congress Avenue in Austin, Texas. As crowds of people walk past, a boy and his dog seem lost in their thoughts on New Year's Eve on South Congress Avenue in Austin, Texas. 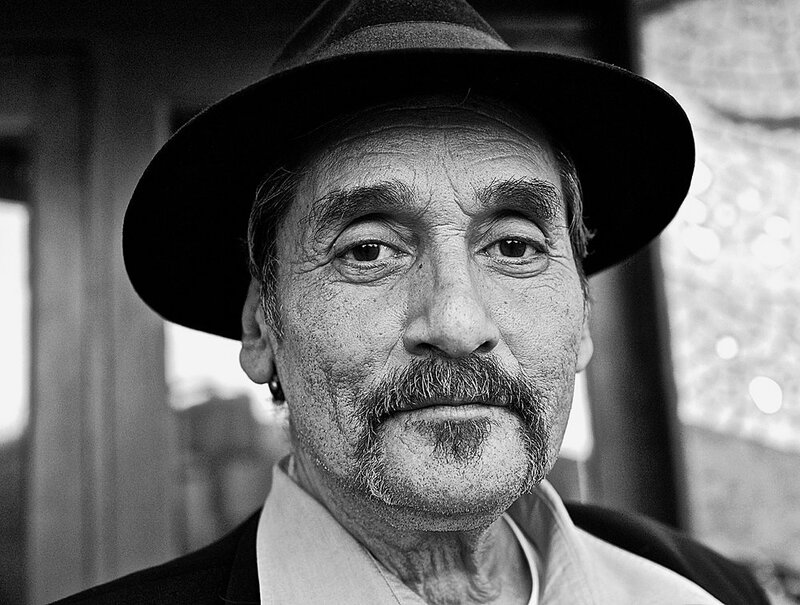 A street musician named Smoky reflects on his harmonica-playing career that has spanned 4 1/2 decades. Smoky played for crowds of people strolling South Congress Avenue on New Year's Eve 2016 in Austin, Texas. Brian, a young homeless man living on the streets of downtown Austin, Texas, struggled to stay warm during a cold front that brought freezing temperatures to the capital city shortly before Christmas. Stephanie Gorski, an assistant professor of biology at Wiley College in Marshall, joined other protesters at the Texas Capitol on Dec. 18 in imploring Electoral College members to not cast their votes for president-elect Donald Trump. None of the protests held nationwide stopped Trump's electoral victory on Dec. 19. But protesters like Gorski, a U.S. Marine who served her country as an aviation electrician in Japan from 2000 through 2005, took pride in knowing that they stood up for their beliefs and value systems. 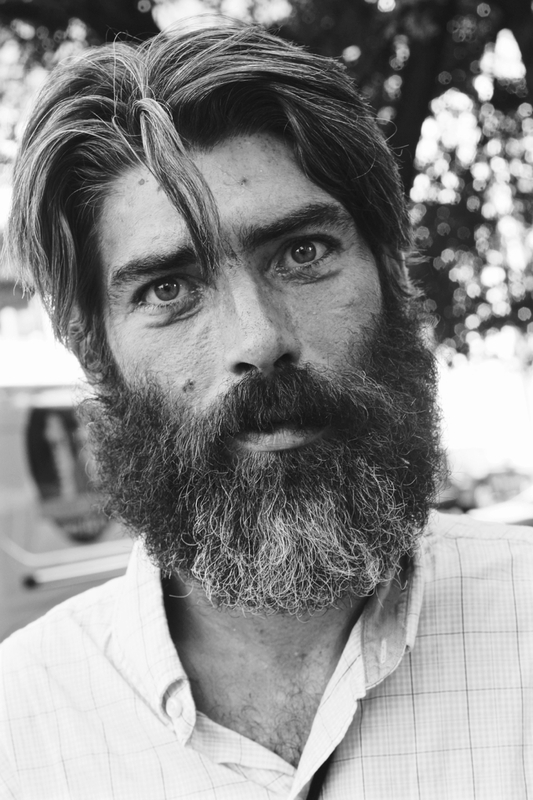 I met Caster, a homeless man living on the streets of downtown Austin, Texas, on a bitterly cold December afternoon near Congress Avenue and Seventh Street. Just a few days earlier, I had met Caster's dog, Daria, and Caster's wife, a woman named Cat. 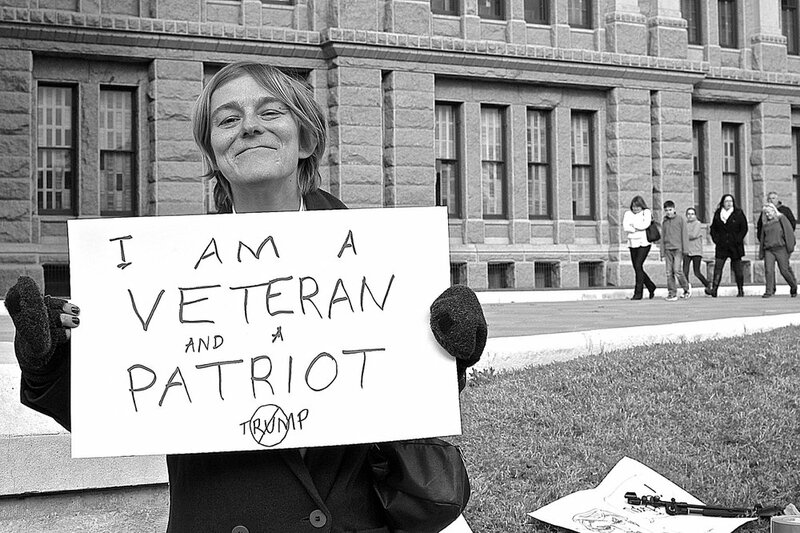 I met Cat, a homeless woman living on the streets of downtown Austin, Texas, in mid-December. Cat's dog, Daria, sat quietly in Cat's lap, watching human and vehicular traffic pass by on Sixth Street as Cat and I talked. Photographer Blake Myers strolls Sixth Street in downtown Austin, Texas, in between his scheduled photo shoots for the day. Wendy Nghixulifwa, an international student at Maryville University in St. Louis, Missouri, poses for a photo with Santa: cowboy Samuel Grey Horse. Santa and his trusty steed, Mula, posed for photo after photo on Dec. 22, 2016, just south of the Texas Capitol before heading downtown on Congress Avenue. Santa Claus, a cowboy named Samuel Grey Horse, rides his beloved Mula down Congress Avenue in downtown Austin, Texas, on Dec. 22, 2016. Santa and Mula gallop away from the Paramount Theatre on Congress Avenue in Austin, Texas. There were smiles and photo ops galore on Dec. 22, 2016, as Santa and Mula clip-clopped their way down Congress Avenue in Austin, Texas. Santa and Mula reach the Ann W. Richards Congress Avenue Bridge in downtown Austin during rush-hour traffic. As traffic zips by, Santa and Mula pose for a classic Austin shot on the Ann W. Richards Congress Avenue Bridge. Their work of good cheer done for the day, Santa and Mula head for home. Construction workers are a common sight in downtown Austin, including here, on Sixth Street. In June 2016, near dusk, I came upon this worker at the corner of South Congress Avenue and Annie Street near downtown Austin. He took a few minutes away from his precision nail-gun work on what would soon be a new restaurant to strike this most regal pose — the stature of a hard-working man. A hard day's work behind them in downtown Austin, two construction workers head for home. Hats off to Federico Frías, left, and store employee Erik Buerkle who sport a fold-up Minnetonka hat and an eight-piece Newsboy-style hat, respectively, in front of the Hatbox: A Modern Haberdashery store on Congress Avenue in Austin, Texas. On many an evening on South Congress Avenue, tourists can hear the elegant trumpet notes played by Dionisio Robinson.